If an intersection is busy or looks difficult, you can always dismount and walk your bicycle across the crosswalk instead of changing lanes to make a left turn. The Saskatchewan Prevention Institute invites you to help build safe bikers! Bicycle Safety Week is an opportunity to focus on the importance of safe cycling through education and events. In Saskatchewan, cycling-related injuries result in an average of 54 hospitalizations of Saskatchewan children and youth under the age of 20 every year. Children between the ages of 5 and 14 are particularly at risk for cycling-related hospitalizations. The Saskatchewan Prevention Institute is providing free resources for you to use in educating children and youth about bicycle safety. To order, download the form below and email it to resources@skprevention.ca or fax it to 306-651-4301. The resources will be mailed free of charge. Orders will be filled on a first-come, first-served basis while supplies last. Order deadline is May 31, 2019. If you have any questions about bicycle safety education and events, email Cara Zukewich, Child Injury Prevention Program Coordinator, at czukewich@skprevention.ca or call 306-651-4316. Cycling and other wheeled activities are great forms of transportation and recreation. Cycling allows children and youth to be healthy and active as well as have fun. Appropriate steps must be taken however, to ensure that children and youth are safe when participating in these activities. Children, youth, parents, caregivers and communities need to be well-educated regarding the importance of safe cycling practices and the devastating injuries that can occur when practices such as helmet use are not followed. Bicycle related injuries are a major threat to the health of children and youth. In Saskatchewan, between 2004 and 2013 there was an average of 53.9 cycling-related hospitalizations per year for children and youth under 20 years of age. Children aged 1 to 4 years experience more cycling-related hospitalizations than other age groups. The most commonly injured body part due to cycling is the upper extremity (shoulders, arms, and hands). Head/neck injuries occurred 27.4% of the time. Of the injuries to the head/neck, the majority were classified as traumatic brain injuries. The majority of bicycle-related injuries are preventable. For cyclists of all ages, falls are the number one cause of injury. Children who are learning new motor skills can be expected to fall more often than older and experienced cyclists. This is true when learning any new wheeled activity. Ensuring proper safety equipment is used will help protect children and youth. When entering the street from driveways, parking lots and sidewalks, a cyclist may not stop and watch for traffic. This behaviour is a frequent cause of car-bike collisions involving children. Always yield to oncoming traffic, and look both ways before entering a street. Riding a bicycle and facing traffic is among the most hazardous cycling practices. Riding a bike on the wrong side of a street greatly increases the chance of a collision with a motor vehicle. A bicycle is a vehicle. Motorists need to respect a cyclist’s right to share the road. Always ride on the right side of the road. Young or inexperienced cyclists may turn or swerve without warning into the paths of cars travelling in the same or opposite direction. When young children are learning to ride a bike they should stay off of busy streets. Sidewalk riding is a common cause of cyclist injury. When a cyclist rides on the sidewalk, every driveway becomes an intersection. Motorists do not expect to encounter vehicle traffic coming from the sidewalks. Sidewalk cyclists can also be obscured by bushes, hedges or fences. If a child is going to be riding on a sidewalk, ensure constant parental supervision and yield at every street and driveway. Refer to the images provided below to locate different parts of the bike when performing a bicycle inspection. Wheels should be securely fastened, with quick release levers turned inwards toward the wheel. They lock by turning, not screwing shut. Wheels should spin without rubbing or wobbling. If wheels rub or wobble, check for trueness and for brake blocks or fenders rubbing against the wheel. Tires should have reasonable tread, no cuts and no bulges. Keep tires inflated to the pressure stamped on the sidewall. Make sure valves are closed. Check for frayed cables and broken housing by looking at them and squeezing the brake levers. Brake blocks should have at least 5 cm of rubber and be mounted with the opening of the holder at the back. Brake blocks should hit the rim squarely. Brake levers should be tightly mounted. Brake levers should not touch the handlebar when squeezed. Each brake should be able to lock its own wheel. A derailleur chain should be under tension and not squeak. A single-speed or three-speed chain should have about 1 cm of play. All rivets should be flush within the links. Keep chain oiled and free from rust and dirt. All the gears should work, with unfrayed, unrusted cables. Shifter thumbscrews should be tight. If the gears are adjusted, the chain should not rub the front derailleur or any part of the frame. There should not be grinding noises. Pedals should spin freely, with a minimum of shake from side to side. Cranks should rotate freely with a minimum of shake from side to side. Handlebar headset should allow free rotation of the handlebars but should not allow any forward and backward motion between the fork and frame. Lock the front brake and rock the bike back and forth to check for any motion. Should be free from bends and wrinkles. Bikes should have the legally required front lights and rear lights or rear reflectors in working order. Handlebar tape should be in good condition and end plugs or grips tight. Drop your bike from about 10 cm off the ground. If there are any rattles, find them and tighten all loose parts. Oil your chain; clean your bike. Check your tire pressure and look for glass or other sharp objects embedded in your tires. Check for and tighten loose parts. Check cables for rust or fraying. Oil brake levers at the pivot point. Check the brake shoes for wear. Check the tires for wear. Annual overhaul of moving parts. Helmet should fit 2 fingers above your eyebrows. Straps should form a V under your ears. 1 finger should fit between the strap and your chin. It is important to remember that children are not just small adults. Children are developing physically and mentally and have many characteristics that make them vulnerable near traffic. Vision: A young child’s peripheral vision is about two-thirds of adult’s. Children may not have the ability to see a car or obstacle that the adult next to them sees. Hearing: Children have acute hearing, but have difficulty localizing sound. This means that they have difficulty determining the direction from which a sound is coming. Children may be unaware that the sound of a vehicle they hear is moving towards them. Hearing: Children have acute hearing, but have difficulty localizing sound. This means that they have difficulty determining the direction from which a sound is coming. Children may be unaware that the sound of a vehicle they hear is moving towards them. Mental Development: Many characteristics of children increase their risk of injury when they are near traffic. Children lack a sense of danger. Children may be impulsive, easily distracted and impatient. Children are not good at judging the speed and distance of approaching vehicles. A child may not have the ability to process all the pieces of information necessary to make safe decisions while near traffic, despite being taught correct safety practices. Older children may participate in more risk-taking behaviours. Needing to wait for a traffic signal, being distracted by friends at the upcoming park, or misjudging the speed of an approaching vehicle in an intersection are just a few examples of how a young child may act in an unsafe manner due to their developmental stage. Physical Development: Balance, strength and coordination are required to safely ride a bike. Children grow rapidly in spurts and because of this they often do not have an accurate awareness of their body size, abilities and limitations; this increases a child’s risk of falling while on a bicycle. A child’s developing motor skills also reduces the ability to avoid obstacles such as holes in the road, pedestrians and other cyclists. 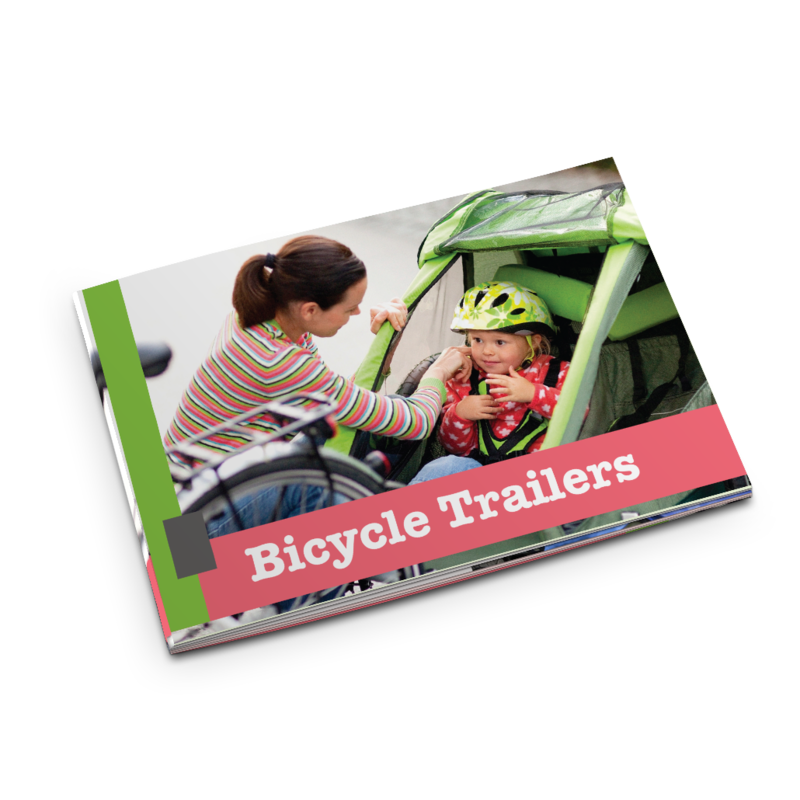 These brochures highlight bicycle carrier and trailer safety messages for caregivers. A bike is a vehicle. As a cyclist, you are expected to follow the rules of the road. Some rules and safe practices to remember when on a bicycle are listed below. Use the correct hand signals for turning left, right and for stopping. Allow only one person on a bike. Do not ride double or carry large packages on your bike. Be visible. Wear bright clothing. Cyclists must be seen by motorists to ensure their safety. Encourage children not to ride at night. If night-riding is unavoidable, use appropriate lights and reflectors. Be predictable – other traffic must know how you intend to act. Signal turns and stops. Cyclists need to know what the traffic around them will do next as well. In this way the road can be shared by cyclists and motorists safely. Pedestrians have the right of way over all vehicles, including bicycles. Let pedestrians cross before you move through an intersection or a crosswalk. Ride single file when with a group of cyclists. Call out stops and turns to the cyclists behind you. Do not blindly follow another cyclist through an intersection; each rider must decide when it is safe to go. Cyclists should ride one metre from the curb. This allows a cyclist to be clearly visible to motorists and to avoid holes, debris, grates and other hazardous objects. Cyclists may move away from the curb when necessary to avoid hazards, turn left and pass slower vehicles or cyclists. Cyclists should ride one metre away from parked cars. This helps avoid car doors that are being opened or cars that suddenly pull-out of parking spots. Cyclists should ride in a straight line from parked car to parked car and not swerve in closer to the curb between parked cars. This will ensure a cyclist stays visible to other traffic and makes predictable movements. When changing lanes, plan the move ahead of time. Before moving, look over the shoulder on the side you will move to and check for traffic. Make a hand signal to tell traffic what you are going to do. Shoulder check again and wait until the path you intend to take is clear. Quickly move to the new lane of travel. When turning right, signal the move while approaching the intersection or after stopping at the corner. Stop if the traffic lights or a stop sign indicates you are to stop. Cyclists must stop and wait for any pedestrians in the crosswalk or intersection to clear before making their turn. When turning left, use the procedure for changing lanes to get to the left turn lane beside the centre line. Signal for the lane change and again for the left turn. After completing a left turn a cyclist must return to the curb position as soon as it is safe to do so. Make a left turn only when the intersection is clear and when signs or lights allow you to do so. Remember that you are crossing in front of oncoming traffic and vehicles travelling from the other direction have the right of way. NOTE: If an intersection is busy or looks difficult, you can always dismount and walk your bicycle across the crosswalk instead of changing lanes to make a left turn. Environmental hazards such as gravel, debris, poor road conditions and other obstacles can be challenging for young children who are developing their balance and strength. Young children should stay off of street ways when rollerblading. Young children are at an increased risk of injury if they ride scooters on roadways where hazards such as vehicles, cyclists and other obstacles exist. Children should ride scooters on the sidewalk of non-busy streets when possible. Uneven ground and obstacles are a risk for anyone riding a scooter, and especially for young children who are still developing their motor skills. Find paths that are free of broken pavement, rocks, and debris when learning to ride a scooter. Wrist guards are not recommended because they may interfere with steering the scooter. Learning to maneuver and control a skateboard takes balance and full-body coordination. Children who are growing and developing will experience changes in spatial awareness, motor coordination and balance. Fast speed and tricks increase the risk of injury to a child. A child who has previously developed the skills to control a skateboard may be at an increased risk of injury when experiencing a growth spurt. Changes in motor ability, coordination and spatial awareness can greatly affect a child’s ability to perform tricks.